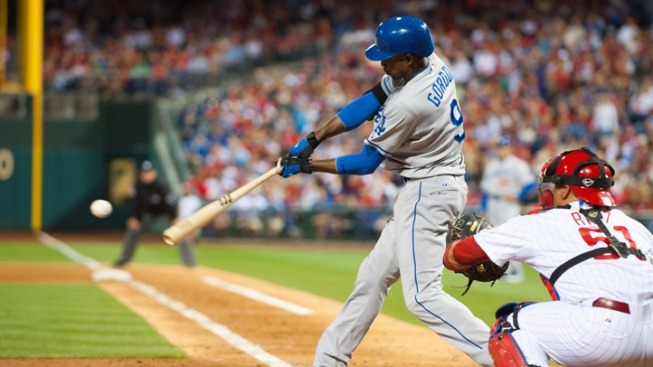 Dee Gordon hit a go-ahead single to back Chris Capuano and the Los Angeles Dodgers held on to beat the struggling Philadelphia Phillies 6-5 on Wednesday night. Jimmy Rollins, Shane Victorino and Ty Wigginton homered for the Phillies, who have lost a season-worst five straight games. Capuano (8-2) gave up four runs and four hits in five innings in one of his least effective starts this season. The lefty has a 2.82 ERA and is tied for the most wins in the majors. Three relievers combined for three scoreless innings before Kenley Jansen finished for his ninth save, including three in this series. Jansen allowed an RBI double to Wigginton in the ninth, but struck out pinch-hitter Jim Thome looking and retired pinch-hitter Brian Schneider on a popup to leave two runners on. The major league-leading Dodgers will try to complete a four-game sweep Thursday afternoon. Phillies starter Kyle Kendrick (2-5) allowed five runs and four hits in 5 2-3 innings. After Rollins hit a two-run shot to give the Phillies a 4-2 lead in the fifth, Kendrick quickly gave it back the next inning. He walked pinch-hitter Jerry Hairston Jr. to force in a run with two outs before exiting. Raul Valdes came in and allowed Gordon's two-run single that put the Dodgers ahead 5-4. The Dodgers tacked on an insurance run in the ninth when Jake Diekman walked James Loney with the bases loaded. Wigginton drove one out to left-center leading off the fifth to tie it at 2. With two outs, Rollins connected to give the Phillies a short-lived lead. Victorino lined his seventh homer into the left-field seats to put the Phillies up 1-0 in the second. But the Dodgers answered with two in the third. Adam Kennedy led off with a single and Tony Gwynn Jr. tripled to deep right to tie it. Gwynn scored when first baseman John Mayberry Jr. booted Capuano's grounder for an error. Help could be on the way for the last-place Phillies, the five-time defending NL East champions who are six games behind first-place Washington. Ryan Howard and Chase Utley played together for the first time in an extended spring training game Wednesday morning in Clearwater, Fla. The team's 3-4 hitters have missed the entire season so far. Howard, the 2006 NL MVP, has been recovering from surgery to repair a torn left Achilles tendon. Utley, a five-time All-Star, has chronic knee problems. Utley may have to hurry. Freddy Galvis, who has filled in nicely at second base, left the game during an at-bat in the fifth after injuring his lower back on a swing. There was no immediate word on when the rookie could return.